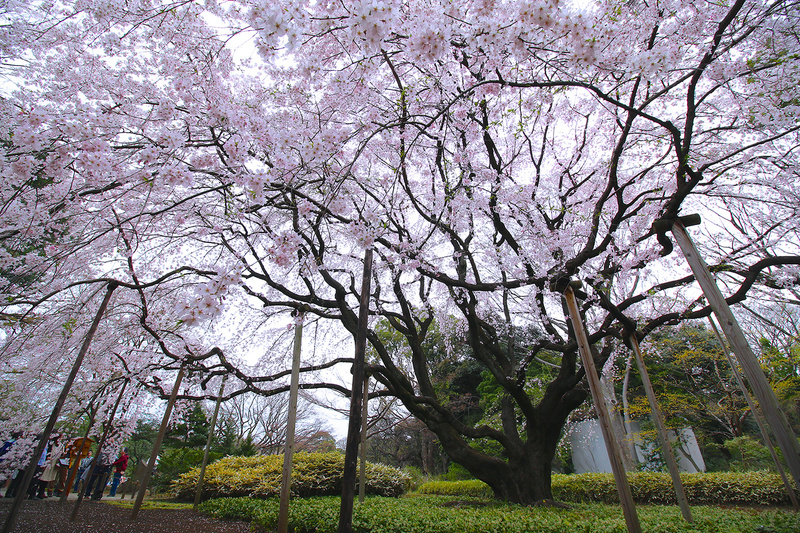 Cherry blossoms in Tokyo bloomed five days earlier than average in 2015. Celebrating this blossoming is a long tradition in Japan. On March 29 -- five days earlier than average -- Japan's cherry blossoms were in full bloom. It's spring in the Northern Hemisphere, and nature knows the routine. Triggered by longer days and warmer temperatures, leaves and flowers bud out sooner. Using the same cues, migrating birds move north, mate and breed. Mammals emerge from hibernation with the same result. By themselves, early cherry blossoms in a single year are meaningless. But more greenhouse gases are polluting the atmosphere and the average weather is hotter. Fall comes later, and spring comes earlier. The desire to figure out how a changing climate is altering the activities of plants and birds is directing attention toward the study of phenology -- timing in nature. * Between 1852 and '58, Henry David Thoreau, author of Walden, recorded flowering dates at Walden Pond, in Concord, outside Boston. Between Thoreau's time and now, the local spring temperature has risen 3.3° C. By 2012, the 32 species he watched were flowering 11 days earlier, on average. During the torrid springs of 2010 and 2012, flowering advanced by three weeks. * Between 1935 and '45, Aldo Leopold, author of A Sand County Almanac, recorded flowering times for 23 species in south-central Wisconsin. Since 1935, spring temperatures in the area have risen 1.8° C and the average flowering date of those plants has advanced 7 days. Mean annual flowering time is creeping forward. Left: comparison of first flowering dates around Thoreau’s shack at Walden Pond between Thoreau’s time in the 1850s, the turn of the 20th century and the 21st century. Right: a look at flowering dates recorded around Leopold’s farm in Wisconsin, observed by Aldo himself in the ‘30s and ‘40s and by his daughter, Nina Leopold Bradley, since the ‘70s. 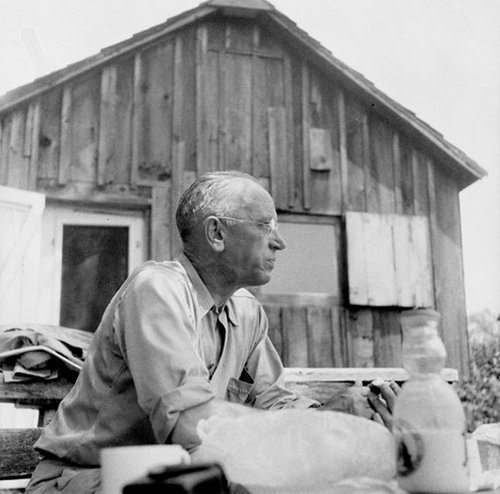 Wildlife ecologist and author Aldo Leopold on the farm near Baraboo, Wisconsin, where he spent years observing flowers and birds. Phenology "is useful for demonstrating the biological effects of climate change," says Richard Primack, professor of biology at Boston University. "A plant starts to leaf or flower in spring in response to temperature, and insects emerge when the plant is active, to feed on leaves and visit flowers, and birds in turn are synchronized to arrive when the insects are emerging." Recent studies "tell us, quite consistently, that the flowering time, and leaf-out time, for shrubs, trees and vines, are very sensitive to temperature," Primack says, noting that leaf-out and flowering are advancing about three or four days for every Celsius degree of warming during spring. As leaf-out and flowering advance, the spring migration flights of many birds are following suit, enabling them to stay in synch with the new plant schedule. "The species that seem to adapt most readily, and shift their timing as spring comes earlier, are the resident birds that live in a place year-round, and the short-distance migrants, which move a few hundred miles north in spring," says Stanley Temple, an ornithologist and professor emeritus of conservation at University of Wisconsin-Madison. "These groups show the most ability to shift timing so they can start defending territory and nesting." 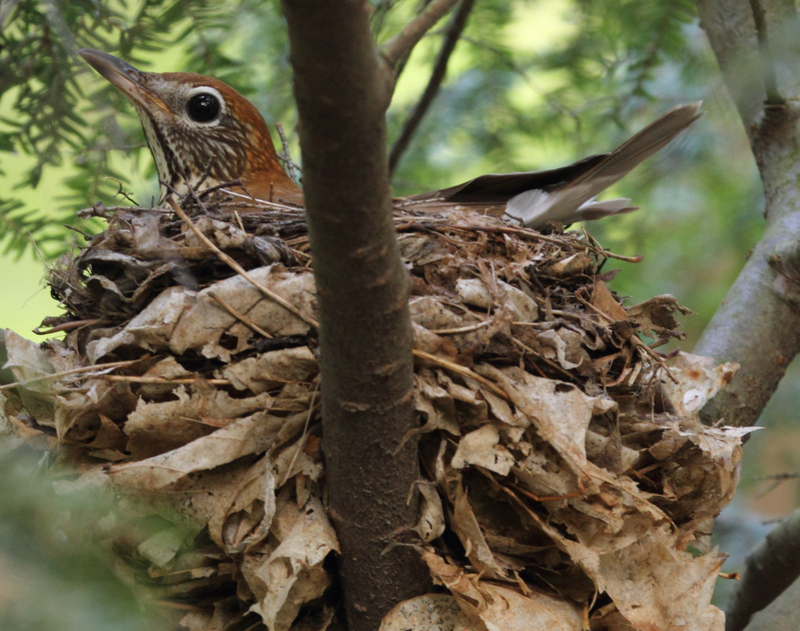 Wood thrush on the nest in the Norfolk Forest Complex, Walsingham, Ontario (north of Lake Erie). Wood thrushes winter in Costa Rica and cannot know the northern weather before they arrive in the North. The long-distance migrants, which reach the United States from Central America and beyond, tend to initiate their migration flights based on day length, and are sticking with tried-and-true timing, Temple says. "The explanation is pretty logical. If you are a resident, or a short distance migrant, you experience the earlier arrival of spring and can adapt. If you are a wood thrush wintering in Costa Rica, you don't have a clue what is happening to the climate up north where you are going to breed. The long-distance migrants seem unable to shift their arrival so it best matches the earlier arrival of spring." After long migrations, birds reach their breeding grounds in the North in a state of extreme hunger. If they arrive after the local spring has sprung, they will miss the flush of insects that they expect to eat -- and to feed to their young. This out-of-synch situation "is something people have imagined would happen, but it's hard to find evidence in North America," Primack says. "We find that when birds arrive in the eastern United States, they seem to eat whatever insects are available." A hungry bird is an "opportunistic feeder" that is not too choosy about the menu, he adds. Temple, however, notes that problems are appearing among birds that feed on caterpillars. "If you are feeding on the earliest phase of the insect life cycle, and you arrive late, you might miss the peak of food availability. There are opportunities to shift food sources for generalists, but a lot of birds, including many warblers, feed their young with caterpillars; it's the major source of protein and minerals; the adults can be more adaptable." 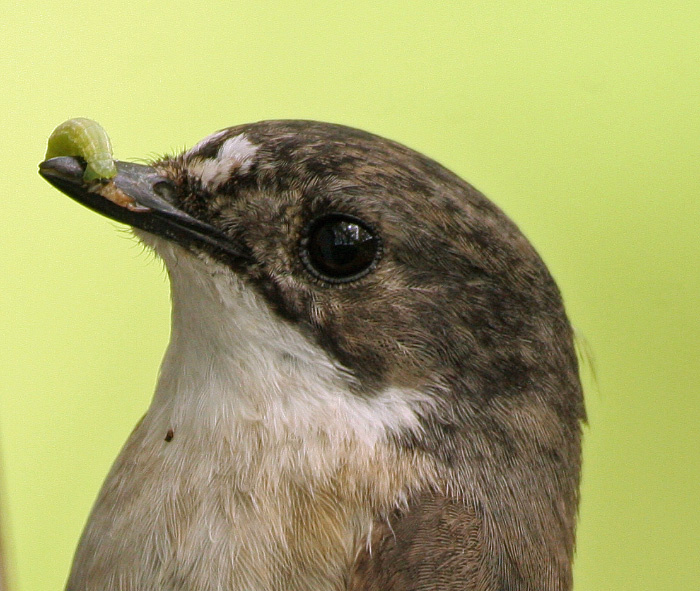 In Europe, the pied flycatcher "has become the poster child for asynchrony," says Steven Travers of North Dakota State University. "The caterpillars they feed on are coming out sooner, and the flycatchers are coming late, and they are disappearing." "Synchrony" is a modern term for what used to be called the natural order: members of ecosystems evolved to compete, survive and reproduce within the range of conditions that characterize the local climate. Plants feed animals, but animals also help plants, and the new spring schedule can cause problems for plants that fail to adjust their flowering to the new climate. "If you flower early or late compared to other plants, visits by [bird and insect] pollinators go way down," says Steven Travers of North Dakota State University. The ideal window for pollination for many plant species is quite tight, he adds. "If you don't get the timing right, that will decrease the number of seeds you make." Travers notes that the growing season in North Dakota is two weeks longer than it used to be before 1970. To measure how that is affecting the reproductive fitness of plants, he is starting to count seeds. Do certain plants benefit from a longer growing season if they flower earlier in the year? 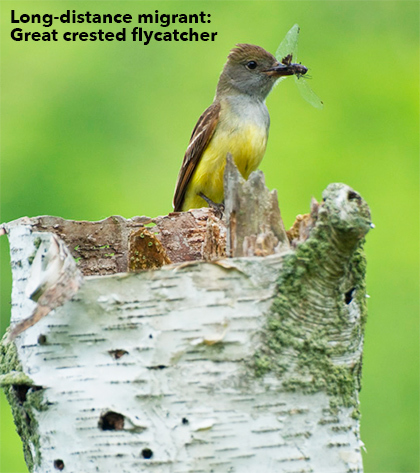 In its breeding grounds in North America, the great crested flycatcher nests in tree cavities made by other animals, like woodpeckers. Rollover to see the European starling, which competes for nesting rights in the same type and size of cavity. These starlings arrive in synch with the new spring schedule; while the flycatcher, a long-distance migrant, tends to arrive on the old schedule, by which time the starlings already occupy the best nest holes, says Temple. "European starlings are adapting really well to climate change, are beginning their nesting and breeding cycle to match the new schedule." Food is not the only factor that an unstable climate may upset. Housing is another. Secondary cavity nesters, birds that must use an existing cavity because they cannot create their own, must compete for housing. "A lot of research shows that a good cavity, one that is watertight and has the right dimensions of opening and cavity, is a really scarce resource that is intensely competed for by birds and mammals," says Temple. "In many instances, where there is intense competition for limited resources, the winning strategy is to get there first. We have seen evidence that late arrival puts some species at a competitive disadvantage." As the unchecked climate experiment continues, what was sometimes seen as a single planetary scenario ("global warming") is subdividing into myriad and often unpredictable sub-plots. Here's one: ironically, an early spring warming can turn a normal frost into a killing frost, as happened in the Northeast United States in 2010. 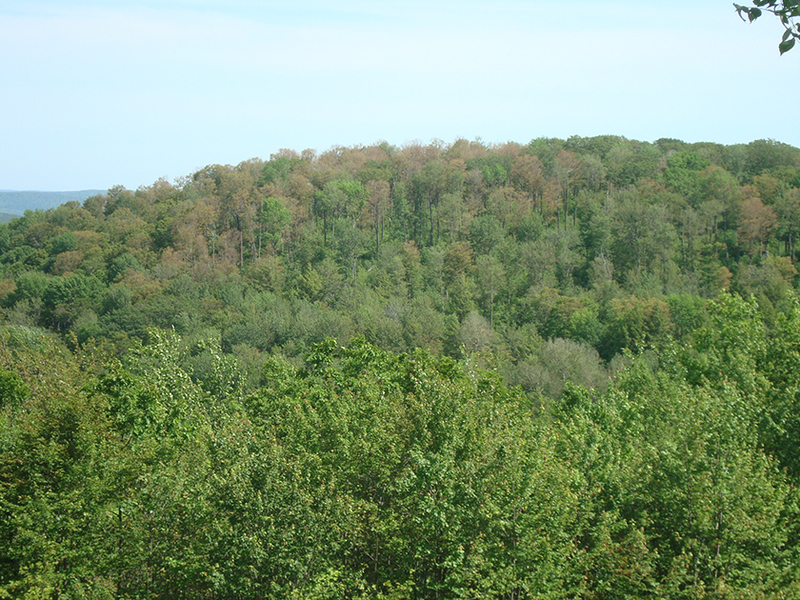 Gray shows frost damage to sugar maples in eastern New York in 2010, after a hard freeze followed an unusually warm spring. Koen Hufkens, of Harvard and Ghent University, looked at the aftermath of that early-May frost1. At lower elevations, the frost destroyed the leaves on sugar maples, but not on yellow birch and American beech trees. Responding to the early spring, the maples set out their tender young leaves earlier, making them susceptible to frost. By waiting a bit longer to leaf out, the beech and birch escaped the freeze. "It's an interesting story," says Hufkens. "The leaves withered, died and dropped off. You had three species, and one got really hit hard by the frost event, but the rest were not affected at all. It was not a particularly late frost; it was a frost that followed an abnormally early warming season." Hufkens and his colleagues measured a 7 to 14 percent reduction in the total annual storage of carbon in trees where the maple leaves died. "This is not peanuts, and this was just a two-day event, just a cold snap. This kind of acute damage can accumulate," Hufkens says. Further mismatches in timing are likely, Hufkens adds. "With rising temperature, the season will start earlier, and what is a normal frost in the current climate will cause this kind of extensive damage." Even though the sugar maples produced a new set of leaves and continued to grow, a succession of untimely frosts could change the mix of species in the affected forests, he says. 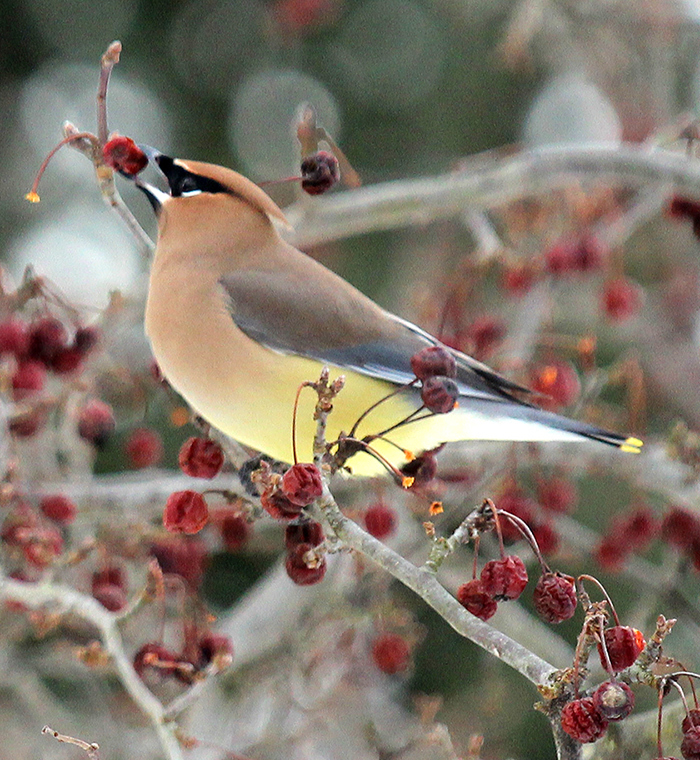 Birds like this cedar waxwing forage berries in autumn before heading south for winter. But early maturing fruits in a warming world means these birds need to pluck berries from late-fruiters, which could include invasive honeysuckle and buckthorn. 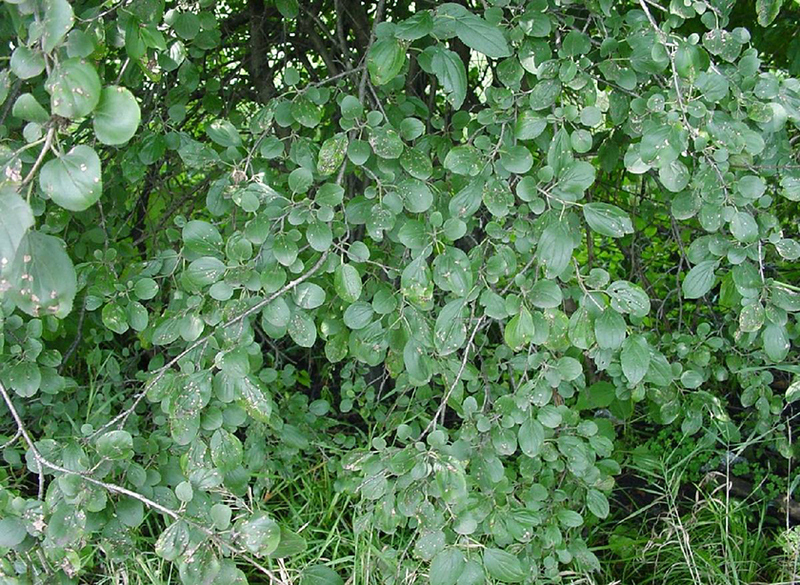 Common buckthorn is a shrubby tree that has invaded large areas in the Eastern and Midwestern United States. A buckthorn thicket prevents the growth of other plants. Is the new schedule for spring and fall playing a role in its rapid spread? Initially, the resurgent interest in phenology focused on spring. But biologically, the change in timing is even greater in fall, and many more factors are in play in the fall, Primack says. "In spring, temperature is the overwhelming driver, but autumn phenology is driven by a combination of temperature, frost events, wind, photoperiod, rainfall and soil drought." Theoretically, fruits that blossom earlier in a warmer climate, like blueberry, huckleberry, and rose hips, might mature earlier in fall. But what is feeding birds that stay later in fall? Primack suspects some of the explosion of woody invasives, like honeysuckle, buckthorn and Asian bittersweet, could be to blame. "One reason these invasives may be so successful is that they provide food for birds that are staying later in autumn, and their seeds are getting dispersed by the birds. The two group may be facilitating each other." A longer growing season should have some beneficiaries, even if the precise mix of species has changed. "We're curious," says Travers. "Are the fall migrants hanging around long enough to fit in another brood? But it's tricky: how you sure when a bird has left?" Ultimately, Travers says, "we are interested in what the communities are going to look like in the future as the temperature goes up and the growing season changes. It's changing very quickly, and it makes sense for the synchrony to be thrown off, unless you can adapt quickly. At this point, weeds and invasive species seem to be better at adapting than native species." When is the severe weather season? What's so lion-like about March?